CB, one-time county cricketer and all-round good sportsman, gave me a hard time the other day because I hadn't recently reviewed any restaurants at the cheap end of the price range. It is therefore fortuitous that my best mate's old man told him of this cheap and cheerful Chinese takeaway joint that served what he claimed to be the best Char Kuay Teow (a kind of wok fried noodle dish) in Perth. A bold claim indeed! I had no choice but to make the long trek North of the river (ok so it's only 15 minutes' drive away, but I'm sure that my fellow Southerners would understand ...) So anyway - CB, this one's for you mate. Tak Kee is located in the suburban Flinders Square shopping centre, which is next to the Dog Swamp Shopping Centre, on Wiluna Street off Charles Street (just before it merges into Wanneroo Road). Why they call it Dog Swamp is a mystery to me. Sure there may even have been a swamp ages ago, but how many dogs needed to have been roaming around for it to earn that moniker? I'm sure Dylan would have something to say about that, since there are apparently large packs of dogs roaming the streets where he works, but maybe that's merely a Dylanesque claim. This is certainly no fine dining venue, but you don't need to be waited upon hand and foot to enjoy a fantastic dining experience. There is space in this little joint for a handful of tables, in case you wanted to enjoy the atmosphere. Ubiquitous plastic tables and chairs abound, and there is a perennial queue of people waiting to order food, or pick up their takeaway orders. Because Brandon and I crapped on while Angela looked upon us with infinite patience, it took us a while to realise that table service meant that they only deliver the food to your table - food hall rules apply. So we got up to order at the counter. Alas - during our 10 minute discourse, there would have been no more than 1 or 2 people waiting at the counter, but as Murphy's Law would have it, we were suddenly smack bang in the middle of rush hour, and finally got to order 10 minutes later. We took solace from the fact that there were a serious number of people patiently milling around the counter in a jostle-free manner, waiting to order or to pick up their orders - the food must be good. And here's a tip: if you've brought a bottle of wine (like any self-respecting Chinese restaurant, this place is BYO), be sure to bring your own glasses, because they keep their handful of wine glasses in the storeroom. Now for the good part! The food came out within a fraction of the time it took us to order, and was freshly cooked. 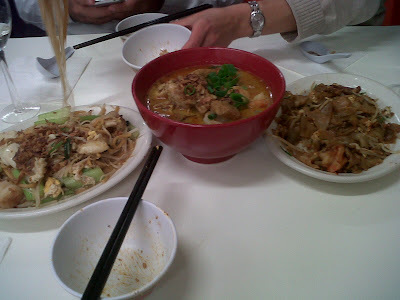 The char kuay teow was mandatory, given the claim made to us, and being laksa aficionados, we also went with the laksa. The last dish was the Singapore Rochore mee (egg noodles cooked in prawn stock). All were superb indeed, in their own particular style. The char kuay teow was different from your run-of-the-mill version. The broad, flat rice noodles were actually plump and moist, not quite what you'd expect from a stir fry. But it did have the authentic smoky aroma and flavour of something freshly scooped out of a super-hot wok. I'm not sure I'd call it the best in Perth, but it's certainly pretty damn good! The curry laksa was quite delicious. It came in a much thicker soup that I expected - virtually gravy like in its rich, thick consistency. But delightfully flavoursome. I don't think that it displaces the Newton Circle (Sidewalk foodhall, Carillon City) from its pole position, but there's nothing wrong with this dish. I'd happily order this again. And finally, the rochore mee was the best I'd tasted in many years - better even than those I'd eaten in Singapore during my last couple of visits. In my eternal quest for the ultimate rochore mee, this is as close as I've gotten so far! The moist, juicy noodles are swimming in a shallow pool of delicious prawn broth, which has a ... well, prawny, but slightly sweet, flavour. The lone calamari was slightly suspect, reeking like a hairy guy who's just played frantic outdoor basketball for an hour in the Perth summer sun, but I gamely downed it, and am happy to report that no gastro-intestinal tracts were harmed in the process (nor, for that matter, were any said tracts irritated to the point of liquefying their contents). Maybe avoid the calamari if you have a weak constitution. The thing to note about this place is that they shut at 8pm, so you need to make sure you get there early if you want to dine-in. However, the people who run this place are friendly, hospitable folk from Hong Kong and Malaysia. Because of our failure to comprehend the ordering rules, it was 8pm when we got our food. And rather than make us feel like we needed to scoff it down, they put up the closed sign but encouraged us to take our time in savouring the food. I guess you could say that we experienced the Chinese restaurant equivalent of a lock-in! And once the shop was closed, they put on their choice of Chinese music - some fast-paced Chinese opera-style singing with synthesisers or the like ... We were even given a complimentary treat at the end of our meal - deep fried flour balls rolled in sesame seeds (and cooked in peanut oil). 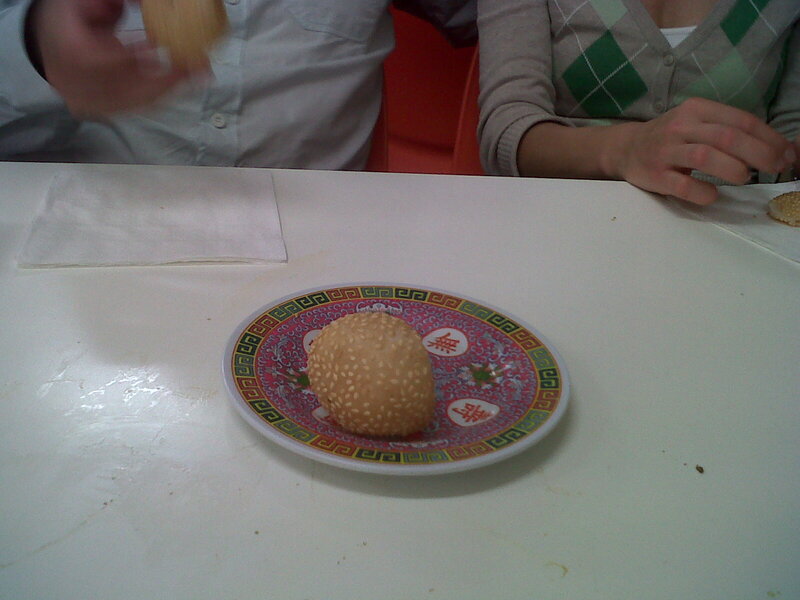 So fresh that steam puffed out when we bit into these delicious morsels. And to top it all off, the chef even turned up to ask us about our food, like you'd expect in a fine dining restaurant. This is truly a fantastic place to visit if you feel like a bit of Asian food, and want something that tastes great, but on a reasonable budget. At an average price of $12.50 per dish, you're not going to need your credit card. I'm planning on going back on a Saturday to try their Saturday specials, which includes a Penang Assam Laksa and a Lor Bak (5 spice pork belly) - stay tuned for further culinary adventures at Tak Kee!